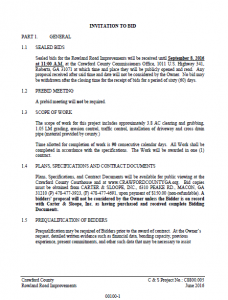 INVITATION TO BID - Sealed bids for the Rowland Road Improvements will be received until September 8, 2016 at 11:00 A.M. Sealed bids for the Rowland Road Improvements will be received until September 8, 2016 at 11:00 A.M. at the Crawford County Commissioners Office, 1011 U.S. Highway 341, Roberta, GA 31071 at which time and place they will be publicly opened and read. Any proposal received after said time and date will not be considered by the Owner. No bid may be withdrawn after the closing time for the receipt of bids for a period of sixty (60) days. A prebid meeting will not be required. Time allotted for completion of work is 90 consecutive calendar days. All Work shall be completed in accordance with the specifications. The Work will be awarded in one (1) contract. Plans, Specifications, and Contract Documents will be available for public viewing at the Crawford County Courthouse and at www.CRAWFORDCOUNTYGA.org. Bid copies must be obtained from CARTER & SLOOPE, INC., 6310 PEAKE RD., MACON, GA 31210 (P) 478-477-3923, (F) 478-477-4691, upon payment of $150.00 (non-refundable). A bidders’ proposal will not be considered by the Owner unless the Bidder is on record with Carter & Sloope, Inc. as having purchased and received complete Bidding Documents. This project will be funded in part or whole by Crawford County monies. Bids shall be accompanied by a bid bond or certified cashier’s check in an amount not less than 10% of the base bid. All bonds shall be by a surety company licensed in Georgia with an “A” minimum rating of performance and a financial strength of at least five (5) times the contract price as listed in the most current publication of “Best’s Key Rating Guide Property Liability”. Performance and Payment Bonds, each in an amount equal to 100% of the contract price shall be required of the successful bidder if contract is awarded. Each Bond shall be accompanied by a “Power of Attorney” authorizing the attorney-in-fact to bind the surety and certified to include the date of the bond. All anticipated federal, state, or local permits required for the project shall be obtained by the Engineer. All anticipated rights of way and easements required for the project will be obtained prior to the above noted bid date. Owner reserves the right to reject any or all Bids, including without limitation, the rights to reject any or all nonconforming, nonresponsive, unbalanced or conditional Bids and to reject the Bid of any Bidder if Owner believes that it would not be in the best interest of the Project to make an award to that Bidder, whether because the Bid is not responsive or the Bidder is unqualified or of doubtful financial ability or fails to meet any other pertinent standard or criteria established by the Owner.